There are 43 defined shoreline survey areas. To help find the map of your area, first view the overlay map of the entire lake. A 15-foot water depth line on each map identifies where most plant and animal species live. We have compiled useful resources that will help guide you on how to determine if a plant or animal is invasive. You do not need to become an expert in plant or animal identification. Over time you will become familiar with the native plants and animals living in your area. Please don't hesitate to contact us if you suspect a plant or animal is invasive. We will visit your area to inspect any suspicious species. If you would like a binder containing pictures and helpful plant identification information, please stop by the LSPA Learning Center. Some volunteers prefer to snorkel or swim while others use an aqua-scope (see photo, right). Aqua-scopes are available on loan from LSPA and may be used from a kayak or other watercraft. 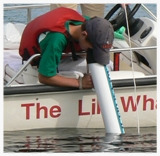 The aqua-scope is a 2-foot long, 4-inch wide tube that you look through to more easily see below the water surface. Polarized sunglasses are another useful tool because they improve your visibility when surveying from a small watercraft. It doesn’t matter what method you use as long as it is consistent and thorough. The area that is surveyed is entirely up to the volunteer. Some volunteers cover the entire survey area while others concentrate on smaller sections of the shoreline as identified on the maps. Depending on the size of the area, there are different strategies you can use to insure adequate coverage such as swimming/boating in a zigzag or radial pattern. If you have a partner, covering an area side by side (parallel formation from shoreline) is also effective. Surveying is best done during the months of July, August and early September. Two - three surveys are preferred because some plant communities can grow rapidly over the short growing season. If you spot a suspicious plant or animal, mark the area with a floating marker (LSPA can provide you one if needed) and notify LSPA so we can come out and have a look. If you don't have a marker try to use shoreline landmarks in your description to us. A floating marker can be made by tying a heavy object (large metal bolt, cored brick, etc.) to a piece of colored foam or other buoyant object. Some volunteers familiar with native plants and animals will note which species they have seen and write down observations, such as the water clarity, while surveying. This is not necessary but is helpful to LSPA for historical purposes. Submitting a report once a month (July, August, September) with the final one sent in by September 30 is an important step because it helps LSPA keep track of what areas have been surveyed and where we need to focus our efforts.